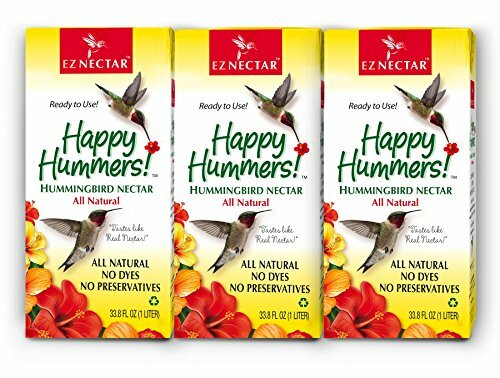 EZNectar is the ONLY ready-to-use hummingbird nectar, EXACTLY LIKE FLOWER NECTAR. Patented because it is all-natural, and ready-to-use, containing no dyes, no preservatives, and no electrolytes. Sometimes preservatives are called electrolytes. Preservative and electrolyte additives are not part of a hummingbirds dietary needs. EZNectar uses only pure cane sugar and filtered water -- it is 100% pure. Your Hummingbirds will love it -- we guarantee it! Now, finally available! The only ready-to-use hummingbird "just like flower" nectar. U.S. Patented because it is sugar & water only, and ready-to-use. No chemical preservatives or dyes. EZNectar uses only pure cane sugar and filtered water - 100% pure. Healthy alternative to homemade! Requires no mixing. It's ready-to-use! "One-of-a-kind". Simply pour into existing feeder. If you have any questions about this product by EZNectar, contact us by completing and submitting the form below. If you are looking for a specif part number, please include it with your message.